How many of you are growing zucchini this year? 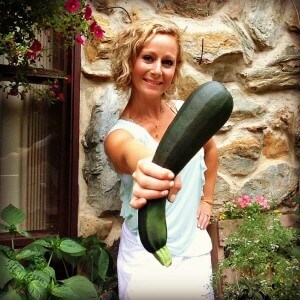 And how many of you have more zucchini than you know what to do with?! So I set out to create a zucchini bread recipe to use up some of my garden zucchini. And I am so happy about how this zucchini bread turned out! It meets all 3 of my requirements for being easy, healthy and delicious. In fact, it’s SO easy that all it takes is 5 minutes and a blender! Anyway, this zucchini blender bread is SO yummy that I made it 3 times in one weekend. And it got big thumbs up from everyone I served it to, including a bunch of little ones who gobbled it up and asked for more. 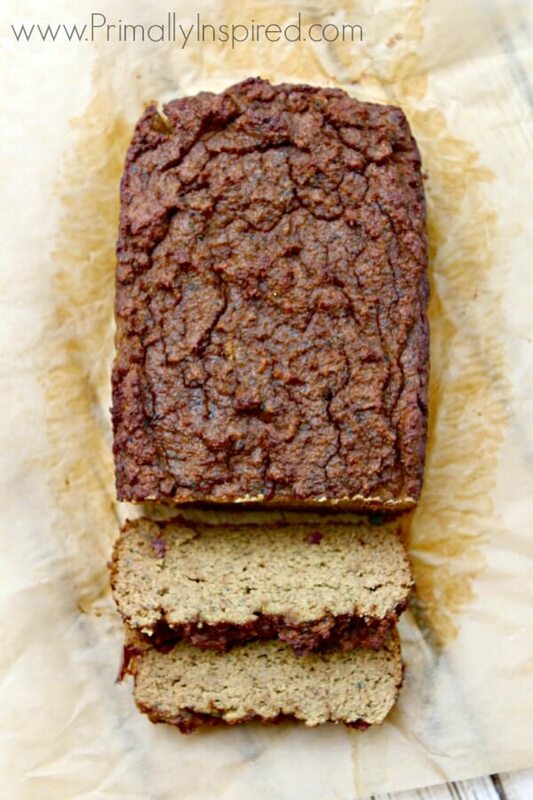 But one of the best parts about this zucchini blender bread recipe is that it contains NO added sugar. Not even honey or maple syrup! It’s 100% naturally sweetened by the dates. Love that! Add zucchini chunks, dates, eggs, butter, and vanilla to a blender and blend until smooth. Add the coconut flour, cinnamon, baking soda, apple cider vinegar and sea salt and blend once again until thoroughly mixed. If you are using any add-in's. Add them now and briefly stir. Pour into a regular sized well greased (or parchment lined) loaf pan (I use THIS loaf pan) and bake for 60 minutes. Enjoy! Want some other healthy Zucchini Recipes? About how many cups of zucchini? I have a huge one so i was going to use some of that. Cannot wait to try this as soon as we get back from vacation! I love recipes that use ingredients I already have on hand. Sounds amazing! I have this sitting on the table right now. Just want to thank you for the idea. I never get out of the grocery store without a bunch of zucchini so I’m sure I will be making this regularly. They taste good and my family loves it! Good addition to my list of bread recipe. i am ready to make this now but med size zucchini is not clear…approximately how many cups? 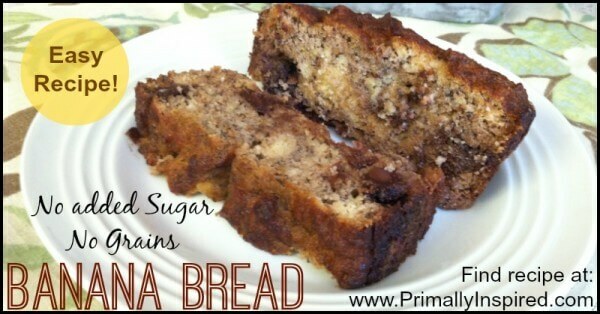 looks awesome and just today i decided to cut back on sweeteners…perfect! Hi Jill! I’ve made this recipe a lot and every time my zucchini has been a little different size – some have been bigger and some have been a little smaller (got to love homegrown zucchini!). This is a really forgiving recipe. Just don’t use the huge, giant zucchini’s and be sure to scrape out all the seeds and you’ll be fine. I actually did use a giant zucchini one of the times, but I just used half of it. Next time I make this, I’ll measure the zucchini in my measuring cup and get an approximate measure and update the recipe to reflect that. But in the meantime, I promise you that this really is a very forgiving recipe. I made this today using about 3 cups of 1″ cubed zucc. I also added scant 1 teaspoon of baking powder hoping for a fluffier top. It was good! I think I need a few more dates to satisfy the hubby’s sweet tooth, and the coconut flour texture takes getting used to over traditional recipes, but I LOVED the blender idea. No more endless shredding! I may have to try a traditional recipe using the blender method. Lord knows I have enough zucchini to experiment! Thank you (and I love your haircut in the photo with your squash). Just made this and now I’m waiting for it to cool! I can’t wait!! Hope you like it, Mical! Any thoughts on substitutions for the dates? I was going to try stevia or a banana. It’ll be a great recipe for the oodles of zucchini! I don’t think you could go wrong with either (or both)! I think I would probably try a banana and a few drops of stevia. If the batter is looking too liquidy, add an extra tablespoon or two of coconut flour. Is this a freezable recipe? 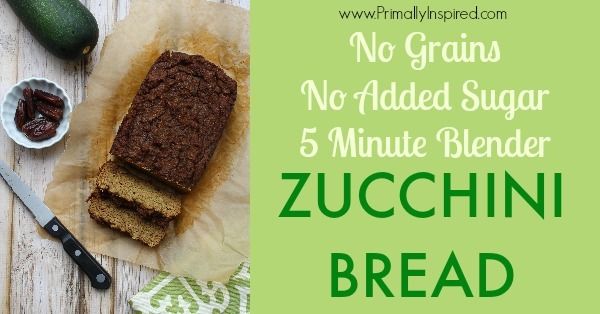 Hi Kelly- can’t wait to try this with all the zucchini we have this summer! Fresh out of dates right now- do you think dried figs might work as a sweetener? Hi Stephanie! Same thing happened to me last weekend – well almost the same thing. I only had 4 dates left so I used them and added 4 figs. It turned out great! I would use about 6-8 figs if I only was using figs. Hey Kelly- Thanks for the tip with the dates and figs. The combo was perfect! I’m back to tell you that I made this recipe again today because I loved it so much, but I made it into muffins! I experimented with some new flavors and made them chai-spiced and they are the BOMB! I just added some ginger, cardamom, black pepper, and nutmeg to the cinnamon and the flavors came together so nicely with the bread! ohmigosh, I must try your chai spiced!!! I am obsessed with all things chai!! I used 2 bananas instead of the dates and it came out awesome. I also added some almonds (soaked) and vita-mixed the woogies out of it 🙂 came out great. I am a fan of your banana bread also, it is a weekly staple around here. Love that you made this your own and your substitutions worked, I think I’m low on dates, might switch some out for a banana!! Thanks! I have some zucchini in the fridge and not sure what to do with it. I intended on making zucchini pizza crust so I shredded 1 large one. Do you think I can use that, eventhough I shredded the entire suzzhini without removing the seeds? As well, I dont have cocoonut flour. I have actually never tried it. I dont have any flours at home since I rarely use the oven or even make desserts. I have homemade oat flour and almond flour however. Can I use this instead? I also think coconut flour is a little expensive for me right now. Thank you for the super fast response! I am very intrigued by coconut flour… am going to have to get my hands on it sooner or later. I am going to use my zucchini to make some fritters instead 🙂 Thanks ! I wish I had the nutritional info. Thanks for the recipe! Hi! We love this recipe! 😀 Any suggestions on a ‘frosting’ (something ‘healthy’ / ‘primal’? Not sure what could hold up and NOT melt on this. A super simple chocolate icing is 1 cup chocolate chips, 1/3 cup coconut oil and 1 tablespoon vanilla extract. Melt everything in a pot. Refrigerate for 20 minutes and then whip with a mixer until it’s nice and fluffy. So good! I’m so excited about making this recipe! I’ve recently started eating clean and have lost 17 pds so far! I don’t eat anything processed and am looking for things I can have occasionally in addition to my fruits and vegys. I bought all the ingredients to make this but accidentally grabbed pitted plums instead of the pitted dates. I’m hoping it will work, what do you think? I would think it would work, Sandy! And congrats on your success with eating clean – that is so awesome!!! I’m getting ready to make the bread and will let you know how it turns out. It came out great with the pitted plums! I made the Caramel glaze to go over it….heavenly!! Hi Kelly, thank you for this recipe. I tried it today and it’s nice. Maybe it was a little too moist for my taste and even though I only had 10 dates it is very sweet for me. rest of the ingredients as per recipe. I’m so excited about this bread! I just made some and I’m wondering if I didn’t bake it long enough (maybe my oven isn’t as hot as I think). It turned out to be a little soggy – almost like a bread pudding consistency. Any ideas for next time? I followed the recipe and a toothpick came out clean after 60 minutes. Either way it’s very yummy and I will work with it! Can I skip the dates? I don’t like sweet bread with ham and cheese! You could, Linda, but I’m not sure how it would taste. Might be good or it might be really bad! But the recipe will still work without the dates. I love you! I think you have saved my life! Finally some recipes I can eat! I bought two of the top paleo recipe books …. yuck! I have been eating the same foods that I can count on two hands for 2 months… I am sick of it! Someone who loves food as much as I do can become so depressed and frustrated when you are under the false impression that, “I’ll never be able to eat again”! 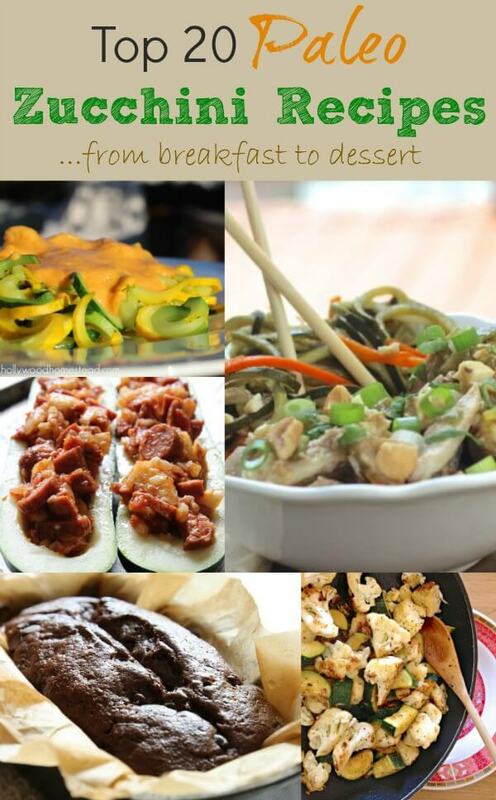 … and due to my long work days, I hate to cook (would be different if I had all day to do it) but these recipes are easy! I am allergic to almond flour (almonds) … all your recipes use coconut flour and arrowroot! woot! woot! woot! I picked up some tips about other substituions for my many food allergies as well! Had anyone tried this with egg substitutes? I usually use gelatin eggs but not sure if it can replace 4 eggs! OMG! I knew this was going to be good when I could smell it in my whole apartment. I was unsure of it at first though because of how healthy the recipe is. Most healthy things I bake don’t turn out THAT great. But this is AMAZING! I added chocolate chips for a little extra sweetness. But this straight up tastes like regular zucchini bread. My only issue with it is it’s very crumbly…it fell apart when I took it out of the pan so getting photos taken of it is kind of out of the question now. oh well! I’m not afraid to share this one with my coworkers! I think they’ll be impressed! Thank you for sharing! This is so flipping good! I can’t stop eating it! I added about 1/4 tsp of both cloves and powdered ginger in addition to some walnuts. Your recipes are fantastic! Love your website. This looks awesome, was wondering what I was going to do with all my zuchinni. Just bought dates today ,looking forward to trying it with figs, too. Hi – just wondering if you know the Carb count on this bread?? 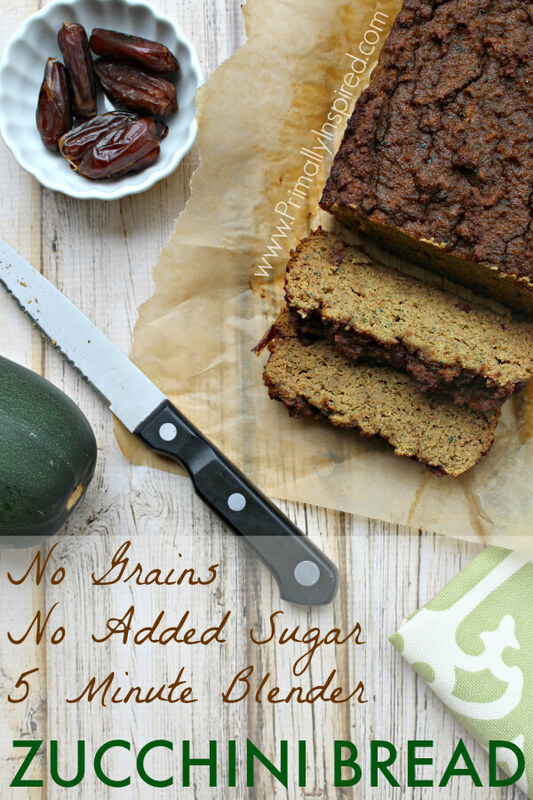 I LOVE Zucchini Bread! Seriously…you must try this…I have made it four times now! I am now making it again to bring with us on our 6 hour road trip. This bread was absolutely delicious! 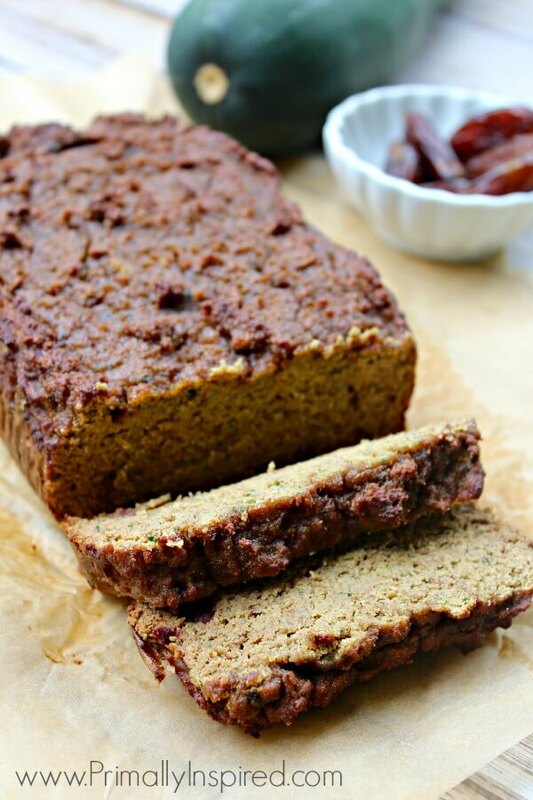 The best Paleo/Whole 30 compliant bread out there. So happy to hear this, Hannah! Thanks for your comment! So happy to hear this, Agne! I’ve never tried it with peanut butter and think it’s a great idea! Just put this in the oven. Is the batter supposed to be so thick – almost like biscuit dough? My traditional recipe usually made something more like cake batter. Now, I did substitute 2/3 c canned pumpkin for the zucchini. Maybe that wasn’t enough? It was thick enough I had to stir it by hand once I added the dry ingredients. My poor little decade-old Cuisinart just wasn’t up to the coconut flour! Hi have you tried this in a bread machine. It gets very hot in Arizona so I like to keep it cool baking itbin the bread machine if possible. I have not, Elizabeth. Anyone else out there tried it? We’d love to hear from you! I just finished getting the bread/cake out of the oven. I am diabetic, so I used 1/4 cup peanut butter and 1/2 cup erythritol sweetener instead of the dates. It came out wonderful. I’m going to make a cream cheese frosting and take it to my Monday night meeting. Oh wow, those are great substitutions, Donna! Thank you for sharing!